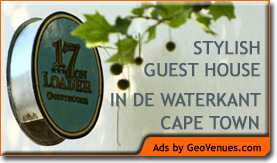 Accommodation in Stellenbosch: The Stables Lodge Guest House. 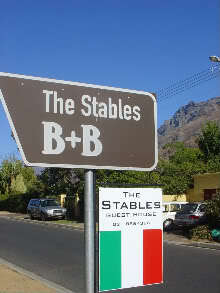 You are here: Home / South Africa / Accommodation in Stellenbosch: The Stables Lodge Guest House. Warm & friendly ITALIAN welcome! AA Highly recommended guest house. Situated in an exclusive area of Stellenbosch, less than 5 minutes from the city centre, ‘The Stables Lodge’ offers panoramic views overlooking the mountains. Accommodation in 6 comfortable rooms with en suite bathrooms, all equipped with air-conditioning-heating, coffee and tea facilities, towels for pool, radio cd players. One self-catering unit is also available. Enjoy a leisurely breakfast, relax in a quiet and welcoming garden with a lovely swimming pool. Secure parking, spacious common area, ‘honesty bar’ with cool drinks and snacks, internet available. The guest house is ideally located to explore the famous wine lands and a lot of other excursions and day trips! 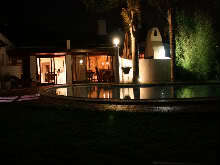 A beautiful atmosphere with a mix of italian & african styles make this affordable stay one to be repeated!